Staff was very friendly and response time was very quick. So sad to be leaving today! My husband and I so enjoyed our stay! The cabin is lovely and we had a much needed break from the world. Thank you for making it available to us! We will be back and will recommend it to all our family and friends. Thank you for sharing your breathtaking cabin with us. We had a wonderful time. Great views, enjoyed the wildlife, sitting in the hot tub at night looking at the stars was my favorite. Its was amazingly beautiful. Nice and quiet getaway. Our family enjoyed the mountains, waterfalls and different views in the Smokeys. Thanks for letting us stay in your beautiful cabin. All of our family enjoyed staying. We enjoyed soaking in the hot tub, the beautiful views and sitting by the fire at night. We also enjoyed a very nice Thanksgiving dinner cooked in your lovely kitchen. Not to mention the service was really fast and helpful. It was a very relaxing stay and we would all love to come back in the near future. The lodge was absolutely amazing. The view was beautiful. Thank you for letting us stay in your cabin. This was an unforgettable weekend for me and my family. 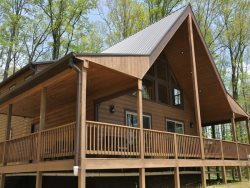 We thoroughly enjoyed our stay at your lovely cabin!. You have done a wonderful job opening up your home away from home and making it so welcoming. I love all of the moose touches. The views....sunrise is worth waking up to here. The location is so serene and peaceful a great getaway for us from our hectic lives. We look forward to our next getaway to Moosehead lodge soon. This cabin is better than we can even express. We greatly appreciated the peace and the song of many birds and the colorful trees. We will never forget all we have experienced on this trip. The cabin was so amazing for the peace, convenience and how clean it was. We are planning our next trip back already. My daughter and son - n - law brought us here for a vacation. We never thought we could top our 50th anniversary trip but the Moosehead Lodge was very warm and inviting. I found this cabin very comfortable and homey as if it were our own. We hope to be back soon. We had such an adventure while here. Thank you for letting us stay in such an amazing setting. This was our third stay with GSCR, the second stay at Moosehead Lodge. We can't thank you enough for allowing us to use your wonderful cabin. Moosehead Lodge and GSCR both exceed our expectations. No complaints or suggestions... only thanks for another great stay to Moosehead Lodge! We had a lovely relaxing week here at your beautiful cabin. Just what needed after a hectic summer. You beautiful Lodge has everything a person could want. Thank you for sharing your home with us. My husband and I fell in love with this cabin in 2008. This week we are celebrating our 5 year anniversary here where it all began. It was a magical stay at Moosehead Lodge. Thank you for sharing your home as you can tell we loved it very much and we will be back. This cabin is charming and decorated tastefully. The mountain view and the deck were amazing. The hot tub was amazing to relax in after long hikes. Thank you for opening your very special home to others. A week in the mountains is just what we needed. I worked with Kathy. She was kind and friendly in answering all my questions. She provided all the information need to plan for the trip. You are awesome.It was peace. I enjoyed the hot tub and barbecue. Definitely will refer to my friends. Our stay at the cabin was a wonderful experience and place. IT was so peaceful and quiet. Bryson City is where you can stay and roam all over the Great Smoky Mountains. All the facilities inside the cabin were awesome. We traveled from NJ to stay in the cabin and it was well worth the drive and we will be recommending it to all of our friends and family. Everyone should experience the cabin life. Thank you so much for sharing. Our stay at your cabin was Wonderful! We thoroughly enjoyed the hot tun and fire pit. We enjoyed our coffee on the deck and enjoyed the view and sounds of nature. The cleanliness and the little home touches were a plus. We will be back for sure. Being from Alaska, I loved the moose decor! Felt like home. My husband and I had a wonderful weekend celebrating our 1st anniversary. We will back! We handled our reservation over the Internet and found that to be an easy process. When we had a few questions, we called and received prompt answers. Amazing cabin. We enjoyed every aspect of our stay. Absolutely hands down beautiful cabin ever! Thank you for letting us stay at your cabin. We had a great time, my husband and I will definitely will be coming back.